Ready to create, grow, and monetize a Podcast? You’re in the right place! My name is John Lee Dumas and I’m the host of Entrepreneurs On Fire, an award winning podcast where I interview today’s most inspiring Entrepreneurs. Since I launched in 2012, I’ve published over 2,000 episodes and Entrepreneurs on Fire generates over a million listens a month. We pride ourselves on transparency, so every month we publish income reports to share our biggest wins, losses and lessons learned so you can emulate our successes and avoid our failures. Here are two FREE resources I know you’ll find incredibly helpful on your podcasting journey. The Podcast Masterclass: How to be a successful podcaster without spending a lot of money or being ‘techie’. What should my podcast topic be? This is the #1 question I receive. First, get your mindset right. Podcasting is a marathon, not a sprint. Your topic needs to light a FIRE inside that will keep burning for the next three to five years, minimum. Your listeners will be able to sense the passion (or lack thereof) in your voice, so make it easy on yourself and choose something you love and are passionate about. When you choose the right topic, podcasting is not work but FUN. Through podcasting you’ll have the opportunity to build relationships with those you admire while learning more about a topic that inspires you. This is the biggest mistake 99% of Podcasters (including myself) make while creating their Podcast: they don’t craft their Avatar. Your Avatar is your ONE perfect listener. It’s a mistake I made. If you try to create a Podcast that resonates with EVERYONE, you will resonate with NO ONE. Your goal is to serve a loyal base of listeners at an incredibly high level. This will only be possible if you know your Avatar inside out and base every decision on what your Avatar would want. Podcast length? Frequency? Interview-based? Topic-based? What Would My Avatar Want? Every question you have about your podcast should be answered by your Avatar; and guess what, YOU create your avatar! I was so committed to this process that I spent $3,000 on an animated video of my avatar, Jimmy. Through this process I came to know Jimmy inside and out, and every time I turned on the mic, I was speaking to and helping Jimmy. Should you create an animated video of your avatar? A pen, paper, and 2,000 words will do. My complete list of recommended Podcasting equipment can be found here. Buying and setting up podcast equipment is a scary thought for someone who doesn’t consider themselves a ‘techie’. I’m here to tell you it’s much simpler than you think. 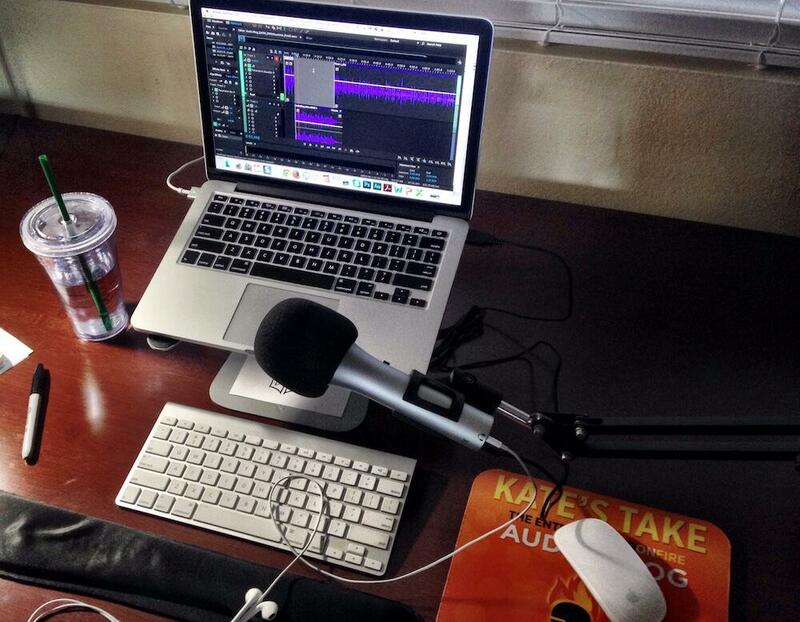 Below is a picture of Kate’s podcasting setup. All you need is a laptop, a mic and recording software. The ATR-2100 microphone (that’s our affiliate link; we recommend the equipment we use and love) is the best microphone for your money, and it plugs into any USB port – super easy! How do I record and edit my podcast? There are 3 recording and editing software options I recommend for recording and editing your podcast. Adobe Audition works with both PC and Mac, but it’s not free. To use Adobe Audition, you’ll pay $20 a month for the Creative Cloud membership. I believe this is one of the best investments you’ll make on your Podcasting journey; becoming an expert in Audition has done wonders for my Podcast. If you’re looking to learn the basics of Audition, a simple YouTube search will do. If you’re looking to become a pro, then within Podcasters’ Paradise I have several in-depth video tutorials I created specifically for Podcasters looking to master the Adobe Audition software. Audacity works with both PC and Mac, and it’s free! There are fewer bells and whistles than with Audition, but Audacity will definitely get the job done for you when it comes to recording and editing your podcast. Within Podcasters’ Paradise we have plenty of tutorials that will get you WELL on your way with Audacity, too! GarageBand is for Mac only, comes pre-installed, and it’s free! Again, you get what you pay for, so there are fewer bells and whistles, but GarageBand will also get the job done for you. Within Podcasters’ Paradise we have plenty of tutorials for you on GarageBand, too! Every single episode of the 2,000+ I have recorded for Entrepreneurs On Fire has been on a Skype-to-Skype call. Why do I insist on Skype-to-Skype? Unlike landlines or mobile phones, Skype uses technology called V.O.I.P. : Voice Over Internet Protocol. There is no need to get technical here (you can Google it if you wish to learn more); all that’s really important to know is VOIP sounds MUCH better than using a cell phone. Please create a free Skype account and send me your user name, as Fire Nation deserves the highest audio quality I’m able to provide, and Skype will ensure that. What if they decline to do so? Simply put, they are not the right fit for Fire Nation, and I move on to the next potential guest. **Note: I’ve never encountered someone unwilling to join Skype. If you’re recording directly into your software for an interview show, a mixer is required. This is a lot more technical than you need to get, especially when you’re first starting out. eCamm Call Recorder works GREAT, and after you record you can split your tracks if you wish to edit on separate tracks (allows you to get a lot more precise with your editing). If you choose Zencastr, that will be your Skype + call recorder in one. It records each side of the conversation separately, so you’ll have separate tracks for editing when all is said and done. Zoom.us is also another “all-in-one” connecting and recording option for interview podcasts. This is actually a lot harder than it sounds, because this is when the imposter syndrome sets in. Who am I to share my thoughts with the world? Who would want to come on my show? As someone who has personally mentored over 70 Podcasters one-on-one, I can say with confidence that you cannot avoid these thoughts. They are part of being human, and the best step you can take is to accept they exist and always will. I have to overcome the imposter syndrome almost every day. In the beginning, I delayed my launch for over 5 weeks because I was scared. How did finally overcome it? I pressed record and I spoke. The words will come, trust me. This is where you can fix mistakes, add intros, outros, calls to action, etc. Adobe Audition makes this process super simple, and in the video below I’ll show you how! Exporting an MP3 file is just like saving a document in Microsoft Word. The export specs I recommend are: 44100 Hz 16-bit, Mono, 64kbps, CBR (constant bit rate). This will ensure your audio files stay small, and this will not only potentially save you money on your hosting account, but it will also save your listeners from having to wait on huge files to download on their computer or mobile device. Tagging your MP3 is an important step as it adds important information to the audio file such as keywords, title and description. I recommend the tagging software ID3-Editor for this, but you don’t HAVE to use ID3 Editor. You can also tag your episode within your media host by adding your title, description, and other relevant info. You will need a media host to store your audio files, and your media host is who will generate an RSS feed for you to submit to the major directories (like iTunes, Stitcher Radio, Google Play, Spotify). My #1 recommendation is Captivate.fm from Rebel Base Media. A community of incredible podcasters in the Private Facebook Group! Click here for a free 15-minute consultation to find out if Podcast Websites is right for you! My #2 recommendation for hosting your podcast is Libsyn. Use the promo code Fire and you’ll get the rest of the current month and all of next month for FREE! In May of 2014, Kate and I took a trip to Europe for 14 days – completely unplugged from our business. Your media host will allow you to schedule episodes to release on any date and at any time you desire. I always stay at least a month ahead with Entrepreneurs On Fire. Once you have all your settings correct on your hosting platform, and you have double checked the release date, it’s time to PUBLISH that episode! When you publish through your media host, nothing really happens, as you have yet to take step 8, which is submitting your RSS feed to the directories who will display your Podcast to the world. Step 7 is, however, a necessary step before you go on to step 8. You have to make sure at least one of your episodes is ‘Live’ for the podcast directory to accept your RSS feed. This step will only have to be done once. Once you’re accepted by a platform, like iTunes, every time you publish an episode it will automatically be sent out to every directory you have submitted your Podcast to. Watch the video below where I go through all 8 steps. Now you have successfully created your Podcast and released it to the WORLD! The rest of this guide will be focused on ways you can grow and monetize your Podcast! Now that your Podcast is live, let’s talk about getting 1,000 raving fans! During our Podcast Masterclass, I share 5 amazing growth strategies that are not mentioned here, so if you’re looking for even more great podcast growth strategies, join us on our FREE Masterclass! We also have an article on the 7 strategies to grow your podcast audience, so be sure to check that out, too! For now, let’s check out 7 incredible ways you can start growing your podcast audience TODAY – right here, right now. 1. Have a Headquarters – and send listeners there! Every Podcaster needs a place to host all the resources, tips and tactics that your valuable episodes are sharing with your listeners; however, most forget to send their listeners there! This headquarters is your website, and the host and platform that I recommend for you is Podcast Websites. As I mentioned before, Podcast Websites is your all-in-one podcast website and hosting solution. If you’re looking for 24/7 individualized support, an amazing community of podcasters, AND an easy website solution you can have up and running in a matter of hours, then Podcast Websites is for you. Plus, Podcast Websites runs on WordPress, so anything you can do on WordPress, you can do on Podcast Websites! Simply book a free one-on-one here to see if Podcast Websites is right for you! Podcast Websites will happily help you transfer your existing website onto the Podcast Websites platform. Once you have your website up and running, don’t forget to let people know about it! You can share the resources you’re creating on social media, email your family and friends about it, and of course, once you launch your podcast, don’t forget to let your listeners know where they can find more great resources from you! In order to grow your Podcast audience, you need a simple, fast and effective way to create landing, sales and email opt-in pages so you can start growing your email list. An email list is one of the very few direct connections you have with your audience, and once you’ve built a strong, engaged email list, the sky is truly the limit. Click Funnels will not only help you build landing pages, but it will also help you build an entire email funnel around it! Best part is, everything is already built for you, so all you have to do is customize the pages and emails to fit your brand. Click here to watch a free workshop that I did with the creator of Click Funnels, Russell Brunson. He walks through Click Funnels and provides a ton of free value for those looking to increase opt ins and conversions through their landing, sales and email opt in pages! There are going to be other amazing podcasts in your niche who are reaching the same or a similar audience that you are. Reach out to the hosts of these Podcasts and suggest an interview swap! This is an amazing way to commingle your audiences and gain awareness and traction for your podcast. I spend a full 10-hour day one time per month being interviewed on 20 other shows because I know that being exposed to other audiences, no matter the size, will continue to grow my name and reputation. Be bold, make the ask, and you’ll be surprised with the responses! …but do it at the RIGHT times and in the RIGHT places! SOOOO many people get this wrong. I hear it all the time on intros, outros, during the episode… heck, I used to do it myself – until I wised up. Podcast hosts LOVE asking for ratings and reviews during their Podcast episodes. But if you think about it, what are most Podcast listeners doing when they are hearing your voice? They’re driving, walking, folding laundry, at the grocery store… you name an activity, they are probably doing it. Now, what are most Podcast listeners NOT doing when they are hearing your voice? They’re not sitting in front of a computer where they can do what needs to be done to leave a rating and review – not conveniently anyway. I have over 3,000 reviews in iTunes, and the reason for this is simple: I ask for reviews at the RIGHT time and in the RIGHT place. Every day my listeners email, tweet and FB message me, thanking me for the show, asking a question, or any number of other things. This one response accounts for 90% of my rating and reviews! Why does asking for Ratings and Reviews this way work so well? A. You’re reaching people when they are in a position to quickly click on a link and take immediate action, and people like taking immediate action. B. You’re giving listeners an opportunity to show they are thankful for your Podcast and the time you took to respond. Believe me, they will be grateful to be able to express their thanks with a rating and review if they’ve taken the time to reach out to you in the first place! Words mean a lot – actions mean much more – and humans recognize this. Once you have ratings and reviews rolling in, the iTunes algorithm will see you are a relevant and loved show, and your ranking will reflect this. As a result, your organic traffic will increase! Your audience will grow to know, like, and trust you if your show consistently delivers high value. However, everyone likes to be involved, have an impact, hear their name, and best yet, hear their question answered by YOU on an episode. Whether you have an interview or a topic-based Podcast, spice things up every now and then with a bonus episode where you take questions from your listeners and answer them! I used to do this on the weekends back when I interviewed five guests per week; I’d have two Q&A episodes on the weekends, and Fire Nation loved it! It doesn’t need to be all the time, but if you let your audience know you care about them and the questions they have enough to create a bonus show around it, then they will become even more loyal and share their featured question with their entire network when the episode airs! Every niche has its rockstars. And what is one thing rockstars have in common? Once you’ve built a platform, reach out to these rockstars and ask for 25 minutes of their time to be interviewed on your show. You also want to make sure your interview stands out from the rest. BE UNIQUE! My recommendation is to share the link to their show notes page on your website versus the episode in iTunes; this way, you get more traffic to your headquarters and the potential for new visitors to find out more about you. This single tactic is a major reason for Entrepreneurs On Fire’s success. Seven days a week an email goes out to today’s guest with the above request, and 7 days a week Entrepreneurs On Fire is being shared with a new audience, some of whom are listening for the first time. Some of those new listeners are choosing to subscribe to Entrepreneurs On Fire; and some become raving fans. For the email template I send to my guests when their interview goes live click here! **Note: getting the “biggest names” on your podcast doesn’t always guarantee success. Some of the “fan favorites” here on Entrepreneurs On Fire are people who aren’t very well-known in the industry at all, and some of my guests who share their episodes and Entrepreneurs On Fire with the most passion are ones who have very small audiences. The size of your guests’ audience isn’t the point; the point is that your show is being shared through word of mouth, and once that snowball gets rolling, the momentum will be impossible to stop! Entrepreneurs On Fire monetizes to the tune of over $150k every month, so yes, there is potential in Podcasting. There is money in growing an audience, and Podcasting is the best way to grow an audience in today’s online world. I truly believe this. I am going to take you through the top four ways to monetize your Podcast, but remember this: your podcast is not your business. Your podcast is a vehicle that can help you grow your business. If you are interested in learning about all the ways Entrepreneurs On Fire monetizes on a monthly basis, you can check out our monthly income reports. I also talk about monetizing in great detail during our Podcast Masterclass, so if you want to come join us to hear more, they are free and a blast! Join us on our next Podcast Masterclass! This one will start off being your smallest source of revenue, but as your audience grows, it will quickly turn into your largest. Your Big Idea, Real Revenue, The Podcast Journal, Podcasters’ Paradise, The Freedom Journal and The Mastery Journal make up a huge chunk of our overall revenue, and that percentage continues to climb as the size of our audience also grows. 1. Create valuable, free, consistent content. 2. Grow an audience who knows, likes and trusts you as a result. 3. Listen to your audience as they share their pain points, needs, desires, obstacles, and challenges. 4. Track this feedback in a spreadsheet or other document. 5. When one or two pain points are repetitively brought to you, create the SOLUTION. 6. Offer that solution to your audience. 7. Ask for honest feedback and pivot / improve what you have to offer as necessary. This is the exact process we used during the creation of Podcasters’ Paradise and Webinar On Fire. It’s not easy, it takes time, and you will fail along the way; but when you finally get it right, put the pedal to the metal and IGNITE! Over the past several years I have personally mentored over 70 Entrepreneurs one-on-one who are looking to launch their own Podcast. I no longer offer this, but I do have a shortlist of highly recommended Mentors, so email me if you would like an intro! So why is mentoring such a great monetization opportunity for Podcasters specifically? Simply put, as a Podcast host who provides free, valuable and consistent content to an audience who wants and needs it, you will become an authority figure in your niche. You will gain a following who knows, likes and trusts you. They will reach out to you with questions and ask for your time, and it is your responsibility as an entrepreneur and business owner to value your time. Take these relationships to the next level and offer them a mentorship package. This was my earliest monetization method, and it could easily become yours, too! What should you charge? How long should the mentorship last? These are all questions you’ll have to answer based on what you know about yourself, your avatar, and your industry. A great place to start is to put a monetary value on your time (seriously ask yourself, how much is an hour of my time worth? ); then figure out how long it will take you to truly make a positive impact on your mentee. Your package might be a 1-hour session, 1 time per week, for 3 months, and cost $3,000. It might be a 1-hour session, every other week, for 1 month, and cost $1,000. You need to put a monetary value on your time and offer what feels right for you and your business. Masterminds are a GREAT way to generate revenue. The Revenue Crew is our mastermind, check it out here to learn more! The Revenue Crew proves beyond a doubt how much demand there is for masterminds that provide incredible value. People want to be part of a tribe; they want to be held accountable; they want to invest in a community where EVERYONE is in it to win it. Model what we have done with The Revenue Crew: offer a community to your tribe sooner than later and you may be surprised with the result! Creating relationships with others in your industry or niche who have products and services to offer you know will be valuable for your audience is powerful. Not only are you creating a strong relationship, you’re also offering something to your audience that will help them on their journey. The cherry on top is that you’ll actually earn an income when your audience decides to take action and buy whatever it is your affiliate partner has to offer. So who in your industry or niche has something to offer you know would be of huge benefit to your audience? Now, get to know them and their products and services intimately. If you feel great about promoting their products and services, then propose an affiliate relationship, where you receive a commission for every sale you send them. This is oftentimes 50%, but could be completely different based on how the product or service is set up, and how they choose to run their affiliate program. EOFire has generated millions of dollars in sponsorship revenue since 2013. The first month we brought sponsors on the show, our total revenue was $12,350 (30 episodes). Since then, our monthly income from sponsorships has risen to over $50,000 some months. There is real money in sponsorships, and I will take some time to really break down what sponsorships are, how you can implement them in your Podcast, and much, much more. Can you start a podcast today and have sponsors lined up at your doorstep tomorrow? Can you start a podcast today in a niche you are passionate and knowledgeable about, (the knowledge part can come with experience); work hard to provide free, consistent value to your audience for a significant amount of time (6 months… a year? ); build a captive and engaged audience as a result; then have sponsors beating down your door to get in front of your listeners? Yes – this is very possible. Let’s take a minute to turn back the clock and go through my first six months at Entrepreneurs On Fire, which we’ll call the “Pre-Sponsorship Days”. This is just one example of how to go from launch to sponsorships, which by the way may NOT be the route you want to take, and that’s ok. Sponsorships are not easy, and they aren’t for every podcaster. I launched on September 22nd, 2012 to four straight days of crickets, AKA no downloads. Zero, zip, zilch (unless you count my personal downloads). Then, as my guests began sharing their interviews with their audiences, my download numbers began to climb. Next thing I knew, I was ranking high in “New and Noteworthy” on iTunes, which began to drive a ton of organic traffic my way. My first email every morning was to my featured guest, whose interview went live that day. Thank you so much for sharing your amazing journey on EOFire. I would be honored if you would share with your audience. The template I use today is downloadable at the end of this post. Soon, the combination of Entrepreneurs On Fire being shared with a new audience daily, and the organic traffic coming my way as a result of ranking high in “New and Noteworthy” on iTunes, got the Entrepreneurs On Fire “snowball effect” rolling. Our guests sharing Entrepreneurs On Fire with their audiences resulted in more downloads; more downloads resulted in higher rankings in “New and Noteworthy”; higher rankings in “New and Noteworthy” resulted in more organic downloads; and more coal was being added to the fire daily! Within 2 1/2 months of launch, Entrepreneurs On Fire was generating over 100,000 unique downloads a month. This was the same conference I had attended just six months prior, which is when I approached people like Pat Flynn and Andrew Warner and asked them to be one of my first guests on Entrepreneurs On Fire. Yes, I got my first guests for Entrepreneurs On Fire from going to NMX and walking up to them, introducing myself, telling them about my vision and mission, and then asking if they’d be a guest on my show. The conference was powerful, and the credibility from speaking at NMX in Vegas landed Entrepreneurs On Fire interviews with Tim Ferriss and Barbara Corcoran in rapid succession. Podcast Launch immediately became the #1 ranked book in Amazon on Podcasting (and remains so), with over 450 5-star reviews. Podcast Launch established EOFire and myself as an authority figure on Podcasting, and because of that, other opportunities began to appear. In mid-March 2013, I was approached by 3 sponsors. I kindly replied by asking for a week to consider the opportunity, and then I immediately got on the phone with a friend and fellow Podcaster who had been in the industry for a while to ask for some unbiased advice. During our conversation, I found out what sponsors had come to expect from sponsorships and podcast hosts. Here’s what I learned on that call, and in the months that followed while working with dozens of sponsors for Entrepreneurs On Fire. Below is the “Industry Standard”; always remember that YOU are the host of your show and should propose any arrangement you feel is best for you and your listeners. If the interested sponsor is not game, then, bye bye. I will share how and why in just a minute. Pre-roll: Prior to launching into the main content, the host will talk about the sponsor’s product or service for 15 seconds. On Entrepreneurs On Fire, we no longer have Pre-rolls on the podcast, but when we did, it was right after the intro music. Click here to listen to a sample. Mid-roll: A lot more flexibility here. Typically inserted somewhere in the 40 – 70% mark of the podcast episode, where the host will talk about the sponsor’s product or service for 60 seconds, often sharing a personal story or experience if possible. On Entrepreneurs On Fire, our Mid-rolls are right before “The Lightning Round”, which puts them close to the 70% mark on most episodes. Click here to listen to a sample. **Another opportunity for sponsorships is during the outro. EOFire has experimented with this for the first time in Q4 2013 with great results. This is the last call to action your listeners will hear, and on Entrepreneurs On Fire, it’s proving to be a call to action that is driving results. So what exactly are these “Industry Standards”? For ease of math purposes, let’s say your podcast averages 10,000 listens per episode. 25 x 10 (for the 10,000 listens) = $250 is the cost to the sponsor for a Mid-roll. Therefore, your 10,000 per episode podcast would cost a sponsor $430 for a Pre-roll/Mid-roll combo. Let’s say you allow 2 sponsors per episode, now you are making $860 per episode. The above model is only the “industry standard”, and I have structured deals with both higher and lower CPM’s; however, most of my deals are at this CPM rate. Look at the download numbers of your episodes starting at six weeks after they go live. Remember, you’re guaranteeing a MINIMUM number of listens, so you need to be confident that you are fulfilling your end of the contract. Once you see that EVERY episode is over a certain number of downloads by week six, that is your CPM. You can adjust this as often as monthly (I adjust quarterly). To be clear, sponsors only care about how many downloads you are guaranteeing for the specific episode they are sponsoring. Go to your stats, look at the downloads you have PER EPISODE, and use that information to find your CPM rate. Awesome! Let your sponsors know that is sometimes the case, and they’ll likely feel pretty darn awesome about the fact you’re sending a little extra traffic their way. Once your quarter (or month) is up with that particular sponsor, then re-evaluate! Cost per mille (CPM): Cost per thousand views (listens in the Podcast world). This is the only way I deal with sponsors. If a sponsor wants to partner with Entrepreneurs On Fire, I will send them a proposal (example template at the end of this article), and they can accept, reject, or negotiate. Negotiating has not been a great option for interested sponsors of Entrepreneurs On Fire, as we receive way more inquiries (demand) then we could ever accept (supply). My Q4 sponsorship inventory was 100% sold out by September because my current sponsors accepted my proposal when I sent it, which was based off the current industry standards. Those who tried to negotiate missed out on reaching Entrepreneurs On Fire’s massive audience with their message. One of the first ways I started monetizing with Entrepreneurs On Fire was by using this model. In Podcasters’ Paradise I have a great video tutorial that walks you through the entire process of setting up a partnership with Audible, where you will get paid $15 for every person you send to their sales page that results in a sign up for a free audio book and free 30-day membership. This is a great example of a “cost per acquisition” sponsorship setup. There were a couple months in a row where I generated between $2-3k per month using this model. For those of you that have heard me say “EOFireBook.com”, that was its original use. In the Podcasters’ Paradise tutorial, I dive into why it was so strategic to use that domain as a forwarding domain instead of the link Audible provides. This strategy has allowed me to stay in control of my evergreen content, meaning if I ever want that URL to direct somewhere new, I can do so without having to change any of my calls to action for it. So why not bring more sponsors on? In this case, I believe having 3 or more Pre-roll, Mid-roll and/or Post-roll sponsors is bad for everyone involved. It’s bad for the sponsor. Their message is getting diminished, less listener action is being taken, and therefore, it is less likely that the sponsor will stay with you when it comes time to talk extension. It’s bad for the listener. Your listener loves listening to podcasts because they’re free, they’re on demand, and they don’t have to put up with annoying commercials on the radio. Podcast sponsorships work so well because it is YOU, the host, that is promoting the product or service, and your listeners trust you. That trust will deteriorate if you make it seem more about the sponsorships than the listener. Finally, it’s bad for the host… you! Why? Your goal is to provide so much value and high-quality content that your listeners not only keep coming back for more, but they tell their friends and family about it. Your goal is to provide great content, increase your listener base, and by default, increase the amount each sponsor pays you per sponsorship. It’s better to have 2 sponsors paying you $430 per episode than 3 paying you $287 for all the reasons above – and every other obvious one. I will never have more than two sponsors on Entrepreneurs On Fire because I care about Fire Nation. I will only partner with sponsors that I believe benefit Fire Nation in their Entrepreneurial journey. I was approached by a Pay-Day loan company that offered me double my going rate to sponsor Entrepreneurs On Fire. I do not believe in Pay-Day loans for many reasons – especially as a recommendation for Fire Nation – so my answer was simple: No. Saying yes would have generated $18k MORE in sponsorship revenue. Not even close to worth it… no dollar amount would be. Show the same care for your audience, and you will be better serving yourself, your sponsor, and most importantly, your listener. My first recommendation to each podcaster who is interested in going the sponsorship route is to sit down. You’re going to turn off some listeners, (although very few if you do it right); you’re going to be sending some listeners away on actions that do not involve your platform; and you will be distracting some focus from the main content of your podcast. Are any of these things bad? No, not necessarily. But I bring them up because they should come with a minimum price tag. So sit down and come up with that baseline price tag. For me, $500 was my baseline number when I first brought on sponsors. I said to myself that if Entrepreneurs On Fire could bring in $500 per episode, that would be $15k per month at 100% capacity… and that made sense. Anything less – nope, not ready yet. In April 2013, I hit that magic number, and my sponsorship revenue has been growing ever since! Also consider the fact that sponsorships might not be right for your show – and that’s okay! Sponsorships shouldn’t be the reason you start a podcast, and they certainly shouldn’t be the focus. How do I find sponsors? Within Podcasters’ Paradise I have some great video tutorials on how to find the perfect sponsors, how to email them, and how to lock in the best possible rate for your show. For purposes of this post, I will share some of those tips with you now. Here are some things to consider based on your niche. Is your Podcast about raising children? I am sure Babies “R” Us would love to offer value to your audience. Fishing? L.L. Bean and Cabela’s are already lining up! Listen to other podcasts in your niche. Do they have sponsors? If so, a well-crafted email to that sponsor could yield a partnership. It has for me on numerous occasions. The secret is out! Podcast hosts have a captive audience. We have engaged listeners. We have followers that know, like, and trust us, and when we put our stamp of approval on a product or service, that means a lot to our listeners – and sponsors know it! Think of the podcasts you listen to regularly. Don’t you feel a closer connection to the hosts than you do to the author of a blog, or some unknown voice on a radio ad? I have a link to a well-crafted email template to the end of this post that I have used to successfully approach many sponsors. Check it out, review it, breathe it in, and then make it your own. Approaching sponsors is not a “one-size-fits-all” situation. You communication with every sponsor should be well thought out, well researched, and unique to you and your show. As discussed above, you should have a minimum number. If your downloads don’t command that minimum right now, then that is fine. Let your sponsors know what your download numbers are and what it will cost for them to sponsor an episode. They can take it or leave it, and you will be better off regardless of the decision they make – stick to your guns. At some point, your download numbers may be able to be inserted into the above “Industry Standard” CPM rate and command a higher price than your minimum baseline number. At that point, it’s time to go back to the negotiating table with your sponsor, and start increasing the amount you receive per episode. Building an audience is an incredible way to create a viable business, and Podcasting is an incredible way to build an audience. But your podcast is not your business. Your podcast is a tool that can help you grow your business. Everything I shared here today is to help you turn your podcast and your business into a viable one, and I hope you’re able to take some of the information provided here and create your own freedom! For further reading on Podcast Sponsorships, visit our Ultimate Guide on Podcast Sponsorships! Is podcasting right for you? This has been quite the journey walking through this guide with you! By now, you should have a pretty solid idea as to whether or not podcasting is right for you. If you know that podcasting is right for you, then we have an amazing community in Podcasters’ Paradise, and we’d love to welcome you to the Paradise family. A community of over 3,200 passionate podcasters who are here to support you on your journey. In depth video tutorials that give you the step-by-step for your podcasting journey. Email templates, sponsor documents, and loads of samples you can replicate for your own podcast. Monthly LIVE webinars with top podcasters, where we share everything that is working for them and why; plus, monthly LIVE Q&A’s where you can ask me anything! Podcasters’ Paradise has turned into an incredible place to take your podcast to new heights, and we welcome the beginner, intermediate, and expert podcaster alike! If you made it this far in one sitting, then congratulations! You’re amazing! So there you have it – How to Podcast: The Ultimate Guide to Podcasting has been written, and I am committed to updating this regularly, and more often if/when major news happens in this exciting world of Podcasting. A final call to action? Now that you have the knowledge of how to Podcast, join our Free Podcast Course and learn how to create, grow and monetize your Podcast in 15 days! Until then… prepare to IGNITE!